The Catskills are known as the birthplace of American flyfishing. Replete with rivers and streams, the area is a destination for many thousands of fisherman and women each year. TU is actively improving a number of trout streams in the Catskills and throughout the southern tier of New York to increase fishing opportunities and to improve habitat for brook trout and other coldwater species in these waters. TU is working on the Cohocton River in Steuben County, Newtown Creek in Chemung County, Owego Creek in Tioga County and Spring Brook in Orange County. In addition, TU is working on improving stream conditions on Sands Creek, an important spawning tributary of the West Branch Delaware River in Delaware County. Additional Delaware County projects are also being developed on Russell Brook and Horton Brook, tributaries of the Beaver Kill. These restoration projects will improve fishing opportunities by reducing stream temperatures, increasing habitat and reducing the amount of sediment that flows into the streams. These projects are funded through the Millennium Stream Improvement Fund, a fund developed as part of the initial permitting and construction of the Millennium Pipeline that runs through the southern tier of New York. The $600,000 fund was established by Millennium Pipeline, LLC for the purpose of improving stream conditions in the areas near to the pipeline route. TU was selected as the organization to administer these projects and is working in cooperation with local organizations to develop and implement projects. Working with local TU chapters, community organizations, the New York State Department of Environmental Conservation (DEC) and other state and local representatives, we chose to restores treams with native brook trout populations or those that were a priority from a fisheries perspective. Depending on the individual needs of the stream, TU will work to stabilize stream banks, plant additional plants along the stream and will replace culverts and bridges as needed. Sands Creek Restoration Project – Phase 1 Completed 2015. 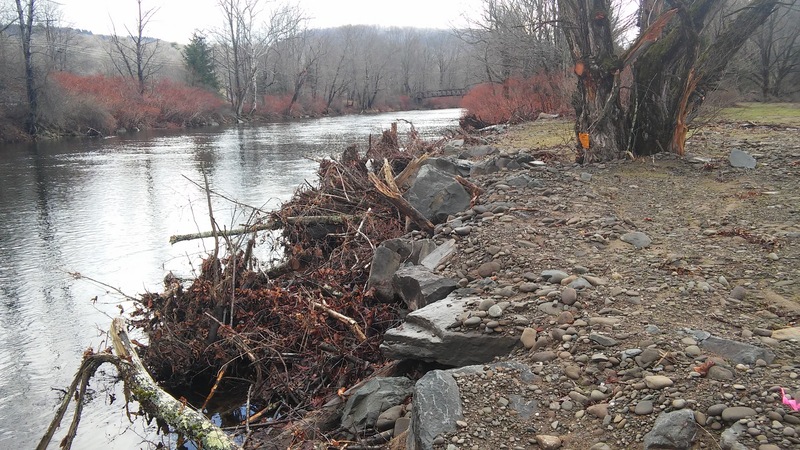 TU and Friends of the Upper Delaware River (FUDR) are working together to improve water quality and habitat for native and wild trout in the Upper Delaware River Watershed through the innovative use of in-stream and floodplain wood structures. The Sands Creek Restoration Project is one of several local projects that will highlight our efforts to restore natural stream process, form and function through the replacement and use of large wood. Sands Creek is a 2nd order stream that flows from its headwaters in the Catskills Mountains to where it joins the West Branch Delaware River upstream from the Village of Hancock and the confluence with the Delaware River in New York. The stream restoration project, located on private property, consists of ten sites where strategic wood structures will be installed along 3,500 linear feet of Sands Creek. The restoration treatments are designed to mimic natural in-stream wood recruitment and include: bank and bar jams, engineered log jams, floodplain roughening structures and bank stabilization wood. Phase 1 of the Sands Creek Project was complete in summer 2015 with the installation of seven of the 10 treatments. Phase 2 will be complete during the summer of 2016. Many funders have supported the development of the Sands Creek Restoration Planning process such as the Millennium Stream Improvement Fund and Theodore Gordon Flyfishers. The National Fish and Wildlife Foundation, U.S. Fish and Wildlife Service, Orvis, Patagonia and others have supported the implementation of the project. Working in partnership with the Town of Colchester, Theodore Gordon Flyfishers and DEC Region 4, TU has completed the replacement of two antiquated, perched culverts on Horse Brook, a tributary to the Beaverkill. The culverts were a barrier to aquatic wildlife passage and a flooding and maintenance issue for the Town. The replacement of these structures with a single span bridge reconnects up 2.3 miles of spawning habitat for trout as well as protects valuable infrastructure. Project funders include: Theodore Gordon Flyfishers, Orvis, and the Camp Fire Conservation Fund Inc., the New York City and Long Island Chapter of TU, TU NY Council Conservation Fund and the NY Fisheries Enhancement Fund. Funding was also provided by a TU Embrace-A-Stream Grant. Other important funders include New York State Environmental Protection Fund administered by the New York State Department of Environmental Conservation (NYSDEC) and the Millennium Stream Improvement Fund. The latter fund was developed as part of the initial permitting and construction of the Millennium Pipeline that runs through the southern tier of New York, and was established by Millennium Pipeline, LLC for the purpose of improving stream conditions in the areas near to the pipeline route. TU was selected as the organization to administer these funds and is working in cooperation with NYSDEC, local municipalities and organizations to develop and implement conservation projects in NY. In 2015, TU began our assessment work (above) on Willowemoc Creek. Located in the Catskill region of south central New York, Willowemoc Creek, a tributary of the Beaverkill has been prioritized by TU for barrier assessment because of its importance for spawning native and wild trout in the Upper Delaware River Watershed. TU’s vision is to ensure that robust populations of native and wild coldwater fish once again thrive within their North American range. It is this vision that has led the organization to prioritize the reconnection of habitat for native species. In New York, TU’s priority is native Brook Trout. The prioritization of TU’s Project area is strategic; the Willowemoc represents high quality aquatic habitat vulnerable to water quality and habitat fragmentation caused by inadequate road stream crossings. The TU survey crew completed a survey on 55 crossings located in the Lower Willowemoc. The prioritized survey results are modeled to rank structures based on the potential for aquatic organism passage and the ability of the structure to successfully pass flood waters. Once the results are in-hand, the team will work with property owners and local government officials with jurisdiction over the structures to come to agreement on priority projects to pursue. From there the team will begin the process of designing, permitting, and raising money for the highest priority culvert replacement project in preparation for the 2016 construction season. Our survey-model -prioritize-replace strategy will result in the most important structures being replaced with ecologically and hydraulically appropriate structures. Our goal is to replace five inadequate structures over the next five years, reducing habitat fragmentation while improving fisheries and community flood resiliency in the Willowemoc Creek watershed. Funding for the initial survey work was from the Wildlife Institute. Additional funds from the NYS Water Quality Improvement grant and the Millennium Stream Improvement Fund have been pledged to complete the first replacement project in 2016. 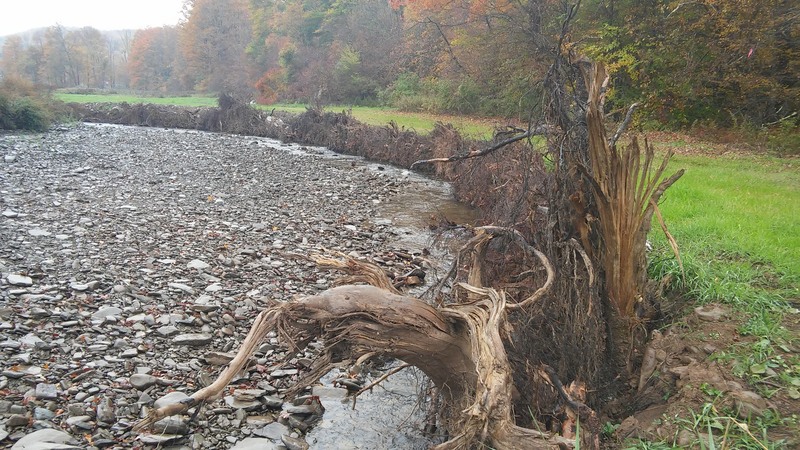 More than 50 trees were harvested onsite and used to stabilize to restore Willowemoc Creek in the vicinity of the section referred to as Wulff Run on the property of the Catskill Fly Fishing Center and Museum. High flow events had resulted in a breach of the creek bank allowing flows to enter the casting pond on Museum property. An exit channel at the lower west end of the pond has also formed as a result of the breach. The project included the installation of 80-100 linear feet of logs, root wads, rocks and fill material to raise the level of the pond outflow to its original elevation. At the upstream breach a 100 linear feet structure of large wood, root wads and rock was installed at bankfull elevation. At this elevation the wood structure will still allow for seepage and passage of flood waters to the pond without allowing another breach to occur or impact the log structure. The project was funded through the Natural Resources Damages fund administered by U.S. Fish and Wildlife Service. 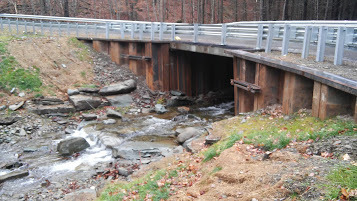 In fall 2014 TU completed the Dry Brook Culvert Replacement Project (above), replacing an antiquated culvert with a new single span bridge. The culvert, located on private property, was undersized, perched and a barrier to fish passage. Dry Brook is a tributary to the Beaverkill near “Trout Town USA” - Roscoe, New York. The replacement of the culvert with the new bridge will reconnect 1.8 miles of high quality head water habitat. The project was funded by the Millennium Stream Improvement Fund and Orvis. TU and the U.S. Fish and Wildlife Service completed a habitat improvement project on Russell Brook (above). Wayne's Dirt Business, a local contractor, installed 40 large trees along a steep and eroding stream bank. With the root mass intact, the contractor created a 15 foot bankfull bench to help reconnect the stream channel to the adjacent floodplain. The 400 feet of wood will capture sediment and large cobble that historically has eroded from the steep bank into the brook. The installation of the structure will improve water quality for trout, reducing large cobble from being transported downstream while creating a diversity of habitat along the structure itself. The project was funded by the Millennium Stream Improvement Fund. TU and U.S. Fish and Wildlife Service complete multiple habitat improvement projects on the East Branch Delaware River near Harvard. Large trees were installed along the river banks with rootwads intact to create a diversity of habitat in an otherwise homogenous stretch of river. In addition to the 480 feet of wood installed, four boulder clusters were installed instream to help create deeper pools for trout to seek refuge from the bald eagles that are often observed hunting in the area. The project was funded by the Natural Resource Damages fund administered by U.S. Fish and Wildlife Service and the Millennium Stream Improvement Fund.